A third generation estate of the Ruivo family, Casa de Darei is a gorgeous 150-hectare property nestled in the Dão Valley in central Portugal, in the municipality of Mangualde. A dedicated natural reserve comprises the vast majority of the area, with beautiful forests that line the Dão River, verdant farmland for cattle, apple orchards, and 6.8 hectares of organic certified grape vines. Darei is the name of the town that the winery sits in, with a population of only 40 people. At the moment, the total production for the estate is just 45,000 bottles annually, focused on the local and indigenous white and red varieties. As a result of the winemaker's sincere focus on traditionally made wines using old cement lagares and beautiful old presses, the wines are clear, focused, and speak to the terroir of the area. Guanito (bat guano) is all the fertilizer they need on their serradela, white clover, and strawberry clover covered ground, to encourage the healthy growth of their native white and red varieties. Striving to only show the natural terroir of their small region, Casa de Darei is all about the tradition of the area, and not the fashion of the wine world. The Darei Vinho Branco is a gorgeous representation of the outstanding white grapes that grow along the Dão River. Coming primarily from the Encruzado grape, which dominates the field blend that also includes Malvasia Fina, Bical, and Cerceal, the grapes are on a neighboring property to the estate that the Darei family manages and farms. These organic grapes are carefully selected and brought into the cellar for a fermentation in both stainless steel and cement vats, and remain with the skins for a few days before being pressed off in order to add extra texture, color, and complexity to the wine. After aging in large cement for several months, the wine is bottled after a light filtration and ready for market. Although fresh and lively, this is not just a white of acid and minerals, as there is wonderful depth in the fruit and organic earth qualities of the wine. Ripe apples, some tropical hints, and a touch of hazelnut define the palate, carried with ample acidity and a long unctuous finish. The 2012 Reserva Tinto is a traditional blend of four of the local grape varieties of the Dão region, Touriga Nacional, Tinta Roriz (Tempranillo), Alfrocheiro, and Jaen (Mencia). With a high elevation and the river’s humidity, the climate is perfect for creating fresh and lively red wines with remarkable acidity. These grapes all come from the small, 5.8 hectare family estate that overlooks the valley and the Dão River, yielding only 5,000 kilos per hectare when it is hand harvested and brought into the cellar. Natural fermentation begins in old and traditional granite lagars, and after a few weeks the wine goes through a basket press to then start malolactic fermentation in large, 5,000 liter cement vats. 24 months pass before bottling and an extra 5 months rest there before it is released, but this wine has longevity to continue aging for several years. The wine is dark and complex in the nose and on the palate, but there is a distinct freshness to the acidity that gives a gorgeous purity and drive behind the wine. Let this wine breath and open a bit before drinking, as oxygen engaging with the juice makes for a lovely evolution in the glass. The Darei Tinto is a traditional blend of four of the local grape varieties of the Dão region, Touriga Nacional, Tinta Roriz (Tempranillo), Alfrocheiro, and Jaen (Mencia). With a high elevation and the river’s humidity, the climate is perfect for creating fresh and lively wines with remarkable acidity. These grapes come from neighboring land of the estate that the Darei family manages and tends to. The organic grapes are hand picked and sorted, then de-stemmed to begin a natural fermentation in both stainless steel and cement tanks. A gentle press is used to pull the skins away from the wine, and malolactic fermentation takes place in large, 5000-liter cement vats, where it also rests for 15 months before resting in bottle for a year. The resulting wine is complex and earthy yet lifted and fresh with bright fruit and acid. Full in the mouth with soft tannins, yet restrained with elegance and purity of the fruit, wonderful amaro tones, and rustic earth tones. 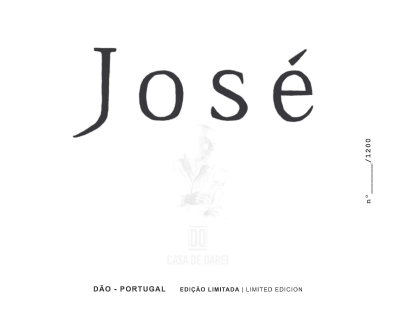 The 2004 José takes its name from José Ruivo, as this tradition of farming was passed on from his family and he was able to realize his dream with opening their estate’s winery. The 2004 vintage was an incredible year for their vines, and this special bottling was not released until 2014, with only 1200 bottles to sell, in order to commemorate their 15-year anniversary at the winery. A blend of their four native red varieties, this combination of Touriga Nacional, Jaen, Alfrocheiro, and Tinta Roriz, was hand-harvested and brought into the cellar for a natural fermentation in old lagars, crushed by foot, and went through a basket press before it’s further aging. Half of the juice went into French barrique for about 9 months before it joined its counterpart in a large concrete vat where it all stayed for about two years. After bottling, it had a long rest to mature and develop into the insanely delicious wine that it is today. The José is elegant and balanced with wonderful aged quality in the fruit, the spice, and the wood character, begging for oxygen to really come back to life with so much remarkable complexity. The 2011 ‘Sem Abrigo’ Reserva is a traditional blend of four of the local grape varieties of the Dão region, Touriga Nacional, Tinta Roriz (Tempranillo), Alfrocheiro, and Jaen (Mencia). With a high elevation and the river’s humidity, the climate is perfect for creating fresh and lively wines with remarkable acidity. ‘Sem Abrigo’ means ‘homeless,’ as back in 2011, this wine came to be because there were a few vats of Reserva that had such a clearly unique and fantastic character to them that they could not be destined to mix with the others. Since it obviously needed to be its own wine, but had no particular name, these vats were considered ‘homeless,’ and all the way through to the wine being finally bottled, the name stuck. Fermented naturally in lagars, and aged in large cement vats, this wine is absolutely alive and delicious. A beautiful cornucopia of fruits, earthy backbone, and a purity given from its clean and characteristic Darei acidity.